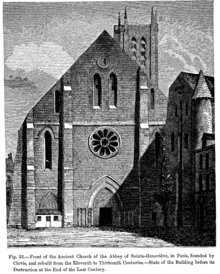 Front of the Church of the Abbey of St Genevieve, in Paris, in a 19th-century engraving of an 18th-century view. The Abbey, close to the Église Saint-Étienne-du-Mont and the present Panthéon (its rebuilt abbey church), was said to have been founded in 502 by King Clovis I and his queen, Clotilde, in the name of the Holy Apostles, jointly dedicated to Peter and Paul. Later Saint Geneviève was in the habit of coming to pray, taking a route commemorated by the name rue de la Montagne-Sainte-Geneviève. At her death in 512, her remains were interred at the abbey church, near the tomb of Clovis. 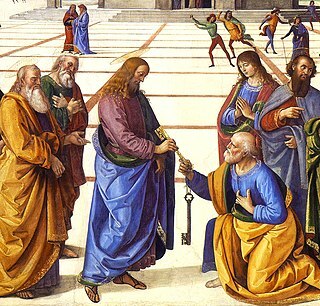 In 1147 secular canons officiated in the church. King Louis VII of France and Pope Eugene III, having witnessed some disorders, determined to restore discipline. At the request of Suger and Bernard of Clairvaux, Gildwin, the first Abbot of St-Victor, sent Odo, the prior of his abbey. There were difficulties, but order finally prevailed and some of the canons joined the reform, the Abbey becoming a house of Canons Regular. Among these was the young William of Paris. At the request of Absalon, Bishop of Roskilde in Denmark, who when a student at Ste-Geneviève's had known him, William was sent to that country to reform Eskilsø Abbey, a monastery of canons in the Isle of Eskil. He founded another monastery, which he dedicated to the Holy Paraclete. He died in 1206, and was canonized by Pope Honorius III. It was natural that close relations should exist between Ste-Geneviève and its foundations in Denmark. Peter Sunesen, a young man who made his profession at the abbey, became Bishop of Roskilde; Valdemar, brother of Cnut the Great, died at Ste-Geneviève; and Abbot Stephen of Tournai wrote to William and his friends to obtain lead for the roof of his abbey. Like the Abbey of St-Victor, Ste-Geneviève became a celebrated seat of learning and the site of a great medieval library. St-Victor, Ste-Geneviève, and Notre-Dame were the cradles of the University of Paris. Peter de Ferrière, Abbot of St-Victor, was at one time prior of Épinay, a priory of Ste-Geneviève; William of Auxerre, a professed canon of St-Victor in 1254, held the office of cellarer, and became Abbot of Ste-Geneviève; and Marcel, successively canon at St-Victor and Ste-Geneviève, was in 1198 made Abbot of Cisoing. In later centuries this abbey fell into the hands of abbots in commendam. In the early seventeenth century Cardinal de La Rochefoucauld undertook the reforms required by the Council of Trent. He brought from Senlis Charles Faure (d. 1644), who had already restored the canonical rule in the ancient Abbey of Silvanect. Once more the Rule of St. Augustine was faithfully observed at Ste-Geneviève's which became the mother-house of the Gallican Congrégation de France, an association of the Augustinian abbeys called the Génovéfains. By the middle of the seventeenth century the abbot-general of the congregation had under his jurisdiction more than one hundred abbeys and priories. Men like Fronteau, chancellor of the university and author of many works, Laleman, Chapponel, Reginier, Chengot, Beurier, du Moulinet, founder of the national library, and Augustine Hay, a Scotsman who wrote the Scotia sacra and officiated at Holyrood, Scotland, in 1687, were sons of the French congregation. The astronomer Alexandre Guy Pingré was librarian of Sainte-Geneviève. In the mid-18th century, a project of reconstruction was begun. An immense abbey church over the old crypt was built, to designs by Jacques-Germain Soufflot; in part rebuilt, it serves today as the Panthéon. When in 1790 the revolutionary assembly declared all religious vows void, and evicted all of the residents of the monasteries, there were thirty-nine canons at Ste-Geneviève's. This was the end of the abbey and school. To run the new rue Clovis through the site, the building was demolished shortly after 1800, except for the bell tower, called the Tour Clovis. The Lycée Henri-IV, built in part with elements of the abbey buildings, occupies the site. ^ "About the Augustinian Canons". Archived from the original on 4 November 2009. Retrieved 2009-10-16. Wikimedia Commons has media related to Abbaye Sainte-Geneviève de Paris. The Tironensian Order or the Order of Tiron was a medieval monastic order named after the location of the mother abbey in the woods of Tiron in Perche, some 35 miles west of Chartres in France). They were popularly called "Grey Monks" because of their grey robes, which their spiritual cousins, the monks of Savigny, also wore. Canons regular are priests in the Latin Church living in community under a rule, and sharing their property in common. Ligugé Abbey, formally called the Abbey of St. Martin of Ligugé, is a French Benedictine monastery in the Commune of Ligugé, located in the Department of Vienne. Dating to the 4th century, it is the site of one of the earliest monastic foundations in France. The original abbey having been destroyed during the French Revolution, the current monastic community dates from 1853, and belongs to the Solesmes Congregation. Saint William of Æbelholt was a French-born churchman of Denmark. The Abbey of Saint Victor, Paris, also known as Royal Abbey and School of Saint Victor, was an abbey near Paris, France. Its origins are connected to the decision of William of Champeaux, the Archdeacon of Paris, to retire to a small hermitage near Paris in 1108. He took on the life, vocation and observances of the Canons Regular, and his new community followed the Augustinian Rule. 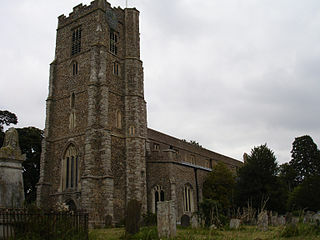 Hatfield Broad Oak Priory, or Hatfield Regis Priory, is a former Benedictine priory in Hatfield Broad Oak, Essex, England. Founded by 1139, it was dissolved in 1536 as part of Henry VIII's dissolution of the monasteries. The Feuillants were a Catholic congregation originating in the 1570s as a reform group within the Cistercians in its namesake Les Feuillants Abbey in France, which declared itself an independent order. Frigolet Abbey is a Premonstratensian monastery in southern France. It is located in the territory of the commune of Tarascon, in the region of the Montagnette, the parishes of which are served by the canons of the monastery. It was originally associated with the Order of Saint Benedict. Moissac Abbey was a Benedictine and Cluniac monastery in Moissac, Tarn-et-Garonne in south-western France. A number of its medieval buildings survive including the abbey church, which has a famous and important Romanesque sculpture around the entrance. Cassan Abbey is an 18th-century building in France, classed as a historical monument. It is located in Roujan commune, Hérault département, Occitanie. Fontenelles Abbey or Les Fontenelles Abbey was an Augustinian monastery in the former commune of Saint-André-d'Ornay, in the Vendée, France.